“According to most people’s thinking, a guy that sits on a big bucket lookin’ north, wearing a cap with the bib of the cap turned east, and he’s got a jug of corn whiskey on his left side on the ground and his pants are torn on the south side of it, and he has a cigarette hanging on his lip that’s west. He’s got to be drunk, or half drunk . . . that’s supposed to be the way a blues singer is . . . but that’s not true. It’s a myth. We’re people just like everybody else.” â€“ B.B. King, from the Chicago Blues Reunion: Buried Alive In The Blues documentary. Jimmy Burns is a blues musician who defies stereotypes, musically and otherwise. 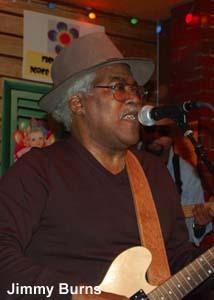 As a singer, guitarist, and songwriter, Burns has built a devoted following at home and abroad with his unique blend of blues, R&B, soul, and gospel. He is a master at taking the old and reshaping it into the new. As a man, Burns is an engaging person whose encyclopedic knowledge of world events is staggering. He immediately won me over when we first met, asking me, a Canadian, about John Diefenbaker, Canada’s conservative 13th prime minister who served from 1957 to 1963. Many Canadians have even forgotten “Dief the Chief”! As I mentioned in my March column, Burns has a new DVD/CD out on Delmark, Jimmy Burns Live At B.L.U.E.S. As Jimmy’s manager, and the wife of his guitarist #Anthony Palmer, I’m not the one to review the set (even though this is Chicago). As a blues fan however, I recently had one of those moments that most of us only dream about, when I attended Burn’s 64th birthday party in February, and I feel bound to share it. When guitarist Jon McDonald (from Magic Slim And The Teardrops), Anthony, and I arrived at Burns’ house on the Northwest side, Burns and his brother, Doc, were watching vintage gospel videos of the Soul Stirrers featuring Jimmy Outler, Johnny Taylor, and Paul Foster on YouTube. Burns, a contemporary of Curtis Mayfield, Major Lance, and Jerry Butler, and McDonald were raised on the North Side, near Cabrini-Green. Both he and McDonald have many stories to tell about the area’s rich musical past. Blues videos supplanted gospel videos with vintage performances by Little Milton, Howlin’ Wolf, Jackie Wilson, and others. I was a participant and an observer, enjoying the videos and feeling privileged to be amongst this group of veteran musicians, kicking back, reminiscing, and living their lives away from the spotlight. Family members and friends arrived throughout the evening to wish Burns happy birthday. 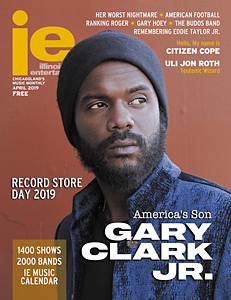 Among them were Chicago blues legend Byther Smith, or “Smitty” to his friends, and Jimmy’s nephew Eddie Taylor Jr., son of Chicago veteran blues guitarist Eddie Taylor. Burns and his wife Dorothy once owned a West Side barbecue joint named Uncle Mickey’s, and they are both great cooks who treated guests to some delicious soul food. Toward the end of the evening, while Smith joined the table of family and friends playing bid whist, Burns, Palmer, and Taylor Jr. broke out the acoustic guitars and jammed on some Delta blues, soul, and R&B. Burns’ birthday party was a magical night full of music and love. NEW RELEASES: Albertville (Ruf) by singer-songwriter/guitarist Corey Stevens is a loving, respectful, and thoroughly enjoyable tribute to one of Stevens’ musical idols, Albert King. Stevens takes a backseat to King, covering tunes King either wrote or covered himself. His one original, “Another Pretty Face,” is King-like with its funky groove and shades of Stevie Ray Vaughn, who was also influenced by King. It’s both funky and rootsy at the same time. Stevens pays tribute to King in the best way â€“ he plays the signature licks but does so in such a way that evokes the spirit of King, yet remains somehow distinct. You know it’s not Albert, but you enjoy listening anyway. Legendary drummer Steve Ferrone (Eric Clapton, The Average White Band, Tom Petty) guests on the album, keeping it funky throughout. Fans of barrelhouse piano will likely find Alton Blues (Delmark) by St. Louis piano player Barrelhouse Buck McFarland a rare delight. Culled from the vaults of Delmark/Jazz Record Mart’s Bob Koester, these tracks were recorded in St. Louis in 1961, eight months before the newly rediscovered McFarland passed away. A fascinating historical document, Alton Blues revisits a school of music that has it roots in Alton, Illinois in the 1920s. McFarland’s bluesy vocals and unaccompanied playing employing percussive bass patterns, steady left-handed rumble and right-handed chords, mesmerize throughout the 17 tracks on this digitally remastered and restored compilation . . . Also from St. Louis comes Street Singer (Delmark) by Cowboy Roy Brown. Brown was born in Arkansas in 1875. Recorded in the mid-’50s when he was in his 70s and 80s, these 23 tracks feature Brown accompanying himself on a guitar named Baby and a kazoo named Leon, singing cowboy standards, blues, and popular tunes. Brown is reminiscent of the bluesmen and women who were rediscovered during the ’60s folk boom, like Leadbelly, Big Bill Broonzy, and Mississippi John Hurt. His varied repertoire includes “Irene” (Leadbelly’s “Good Night Irene”), “Bill Bailey Won’t You Please Come Home,” and “You Are My Sunshine.” Cowboy songs include the Gene Autry medley “Empty Cot In The Bunkhouse Tonight/Have I Stayed Away Too Long” and “Come Sit By My Side.” A delightful storyteller, singer, and guitarist Brown would most likely have become a hit on the folk music circuit had he lived into the 1960s. Jonathan McDonald jr. Did not grow up NEAR carbrini green. He grew up (IN) carbrini green: 1117 NORTH CLEVELAND #1901. As his younger brother I experienced his first blues encounter. December of 1966. My father presented jr. with his first guitar ever. A brand new, Still in the box, In all its xmas glory…. The tiger guitar/ strp on amp from the renco toy company. It cost my dad a hard earned $3.00! It was trully a christmas tantrum moment for jr. A few months later My cousin Marvin Jackson taught Jr. How to tune and play.